Manfred Mann released a series of highly commercial singles during the 1960s that remain iconic today. However, they came from a blues and jazz background and this is evident in their first LP. 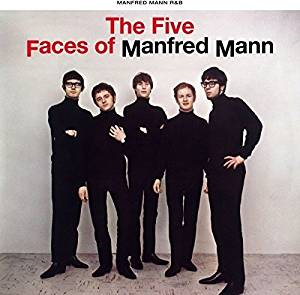 The Five Faces of Mann shows why Manfred Mann were one of the most important group of the British Blues Explosion of the mid-1960s alongside the Rolling Stones, the Kinks, the Yardbirds, the Animals and many more. The album contains a mix of standards as well as original group compositions. Down the Road Apiece appeared on the second LP by the Rolling Stones and will be familiar to many although maybe not the slightly different version by the Manfreds. Bo Didley's Bring it to Jerome was written by his maracas player Jerome Green and, maybe because of the different, writer does not have the trademark Bo Didley beat. It's Gonna Work Out Fine may be familiar to many as it was a hit single for Ike & Tina Turner in 1961. Smokestack Lightning is another standard that will be familiar, particularly to Yardbirds fans. There were also strong jazz influences in Sack O'Woe and Mr Anello, the latter being a composition by the band. Six of the tracks are original compositions although Paul Jones, who was credited as composer on all of them, does admit to his an the band's influences in his sleeve notes. Listen out for Can I Get a Witness, Hi Heel Sneakers and James Brown. As this was the first LP release the tracks are probably very similar to the band's live set at the time. Manfred Mann became well-known for a stream of classic hit singles through the mid-1960s but this album will show the "real" Manfred Mann with the band's blues and jazz influences. As such, it is an essential addition to any collection of 1960s British R&B.